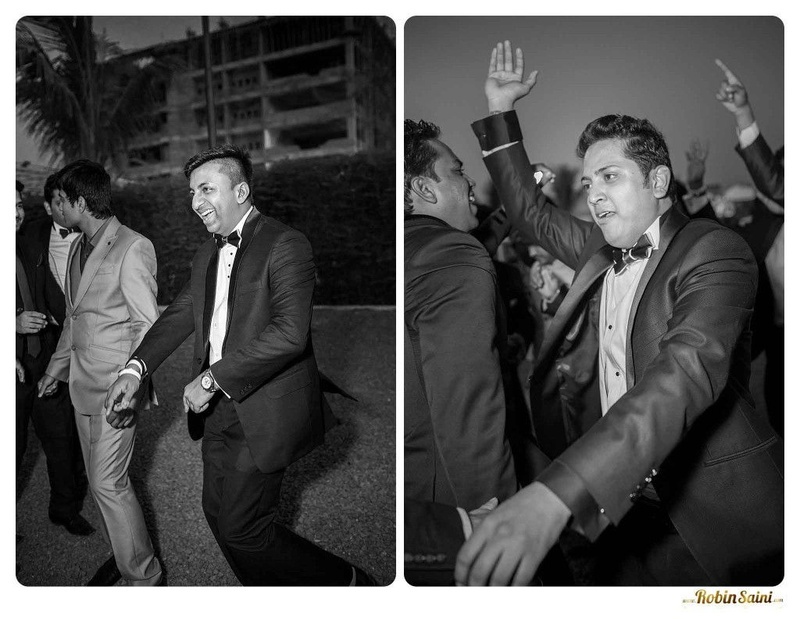 When we call this a Big Fat Indian Wedding, we mean BIG FAT INDIAN WEDDING! 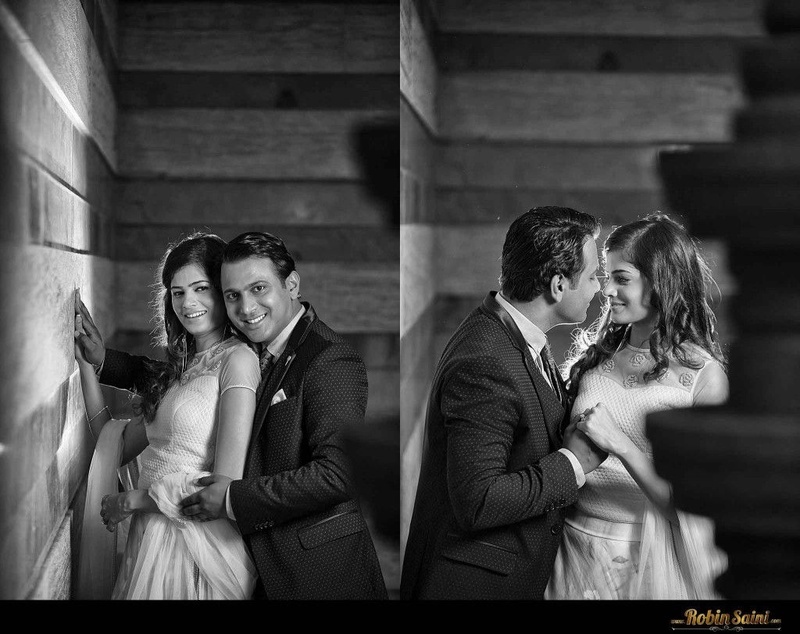 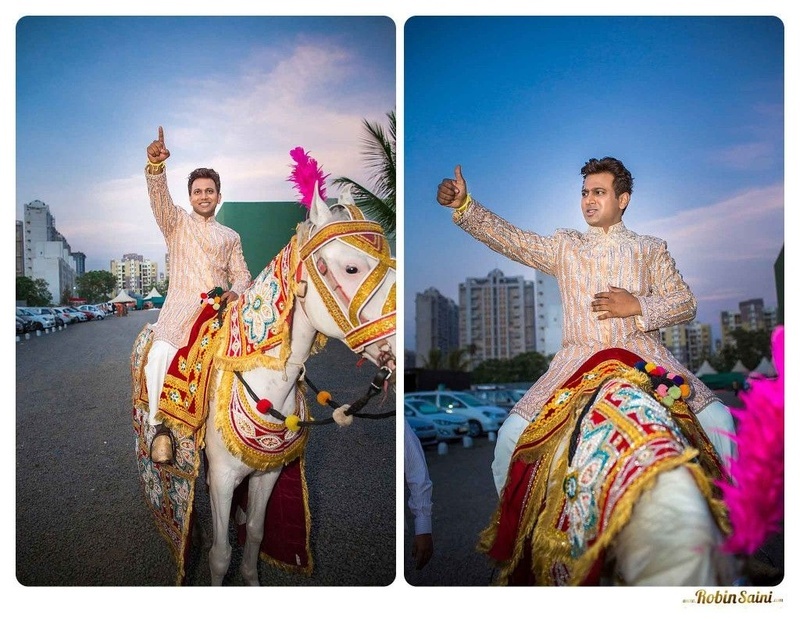 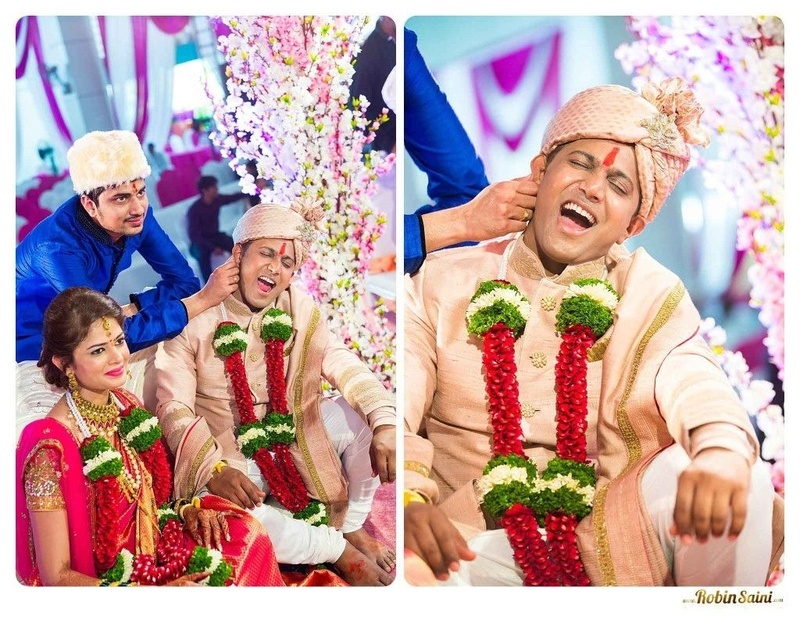 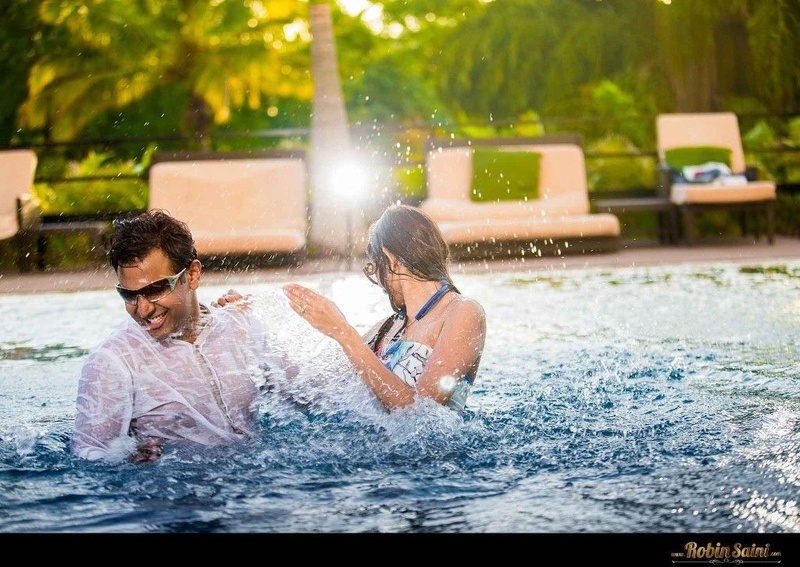 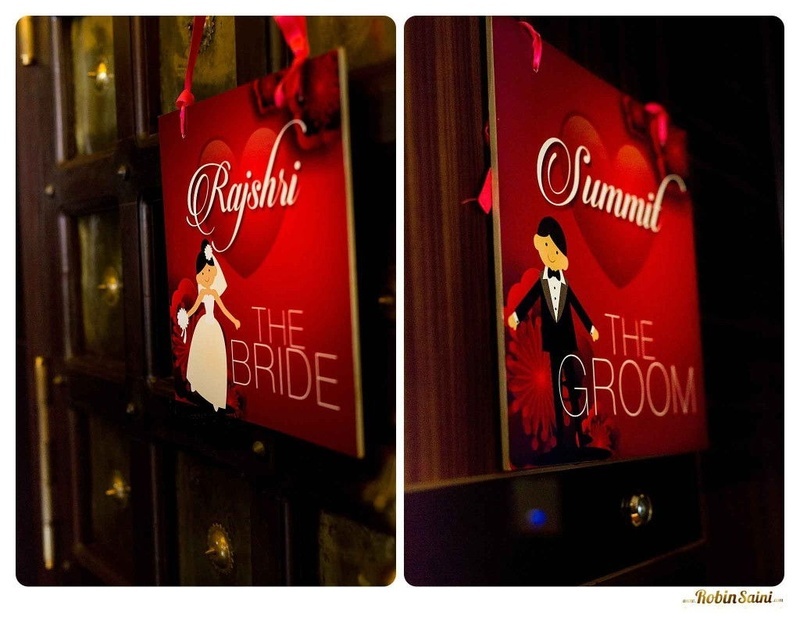 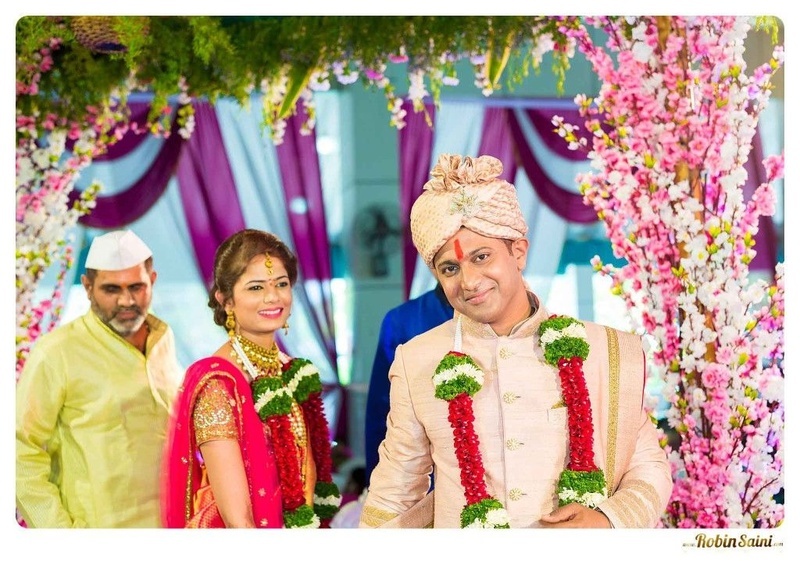 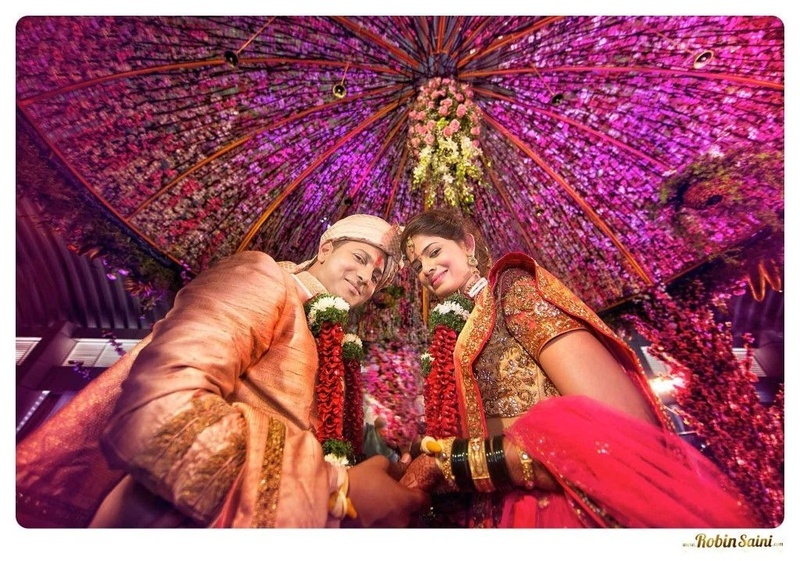 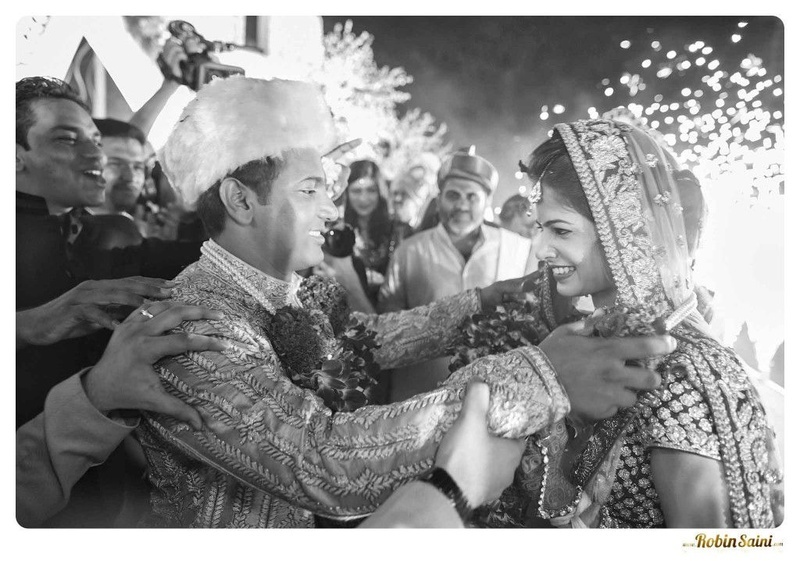 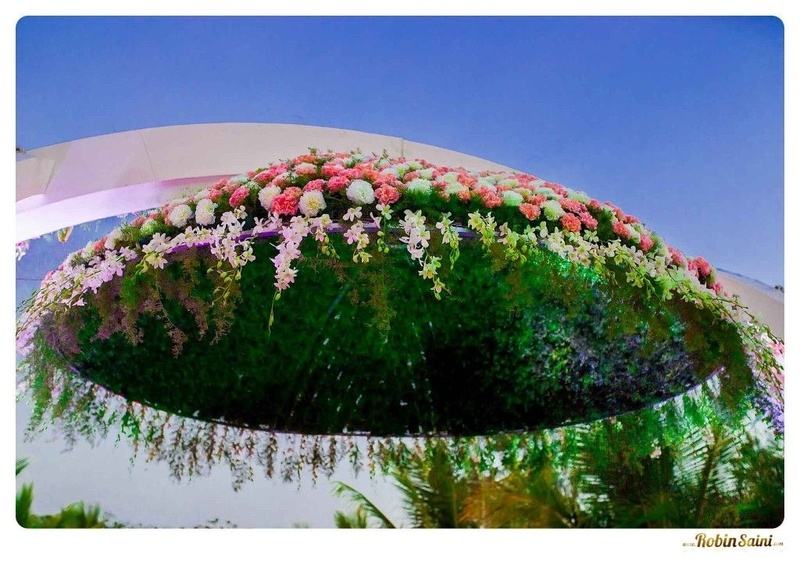 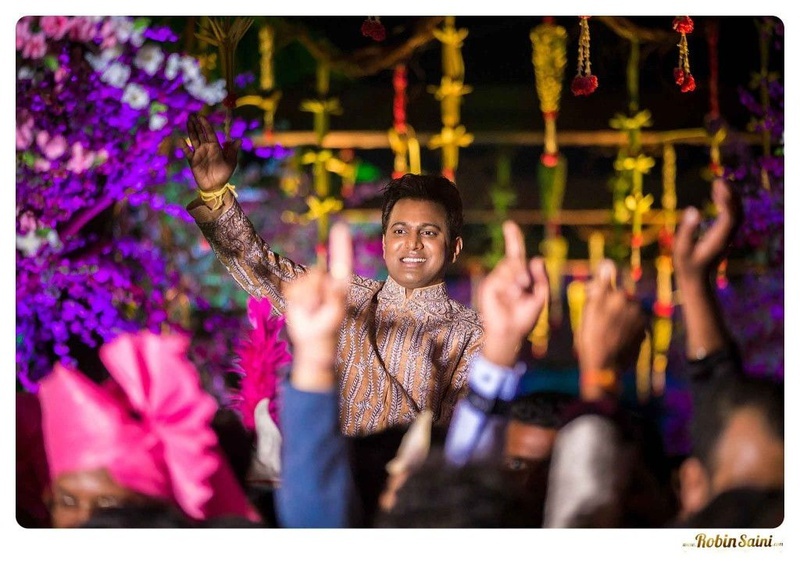 Rajshri and Summit’s wedding celebrations were bursting with grandiosity and elegance in every aspect. 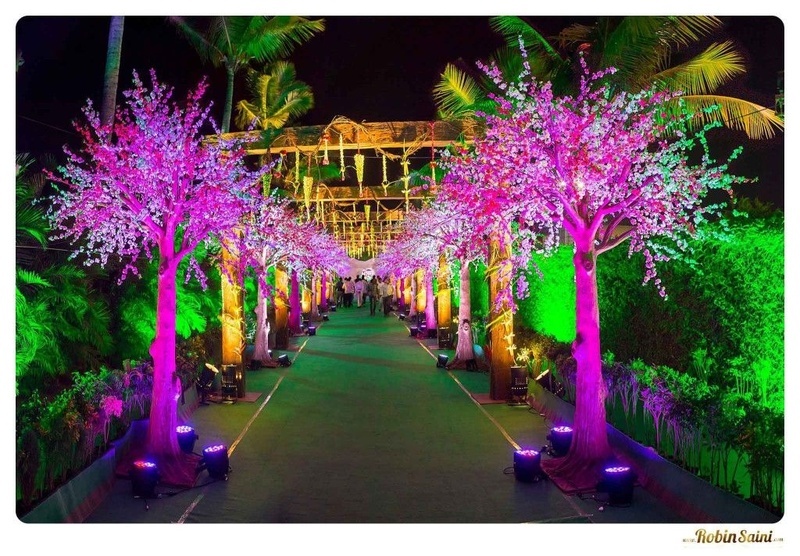 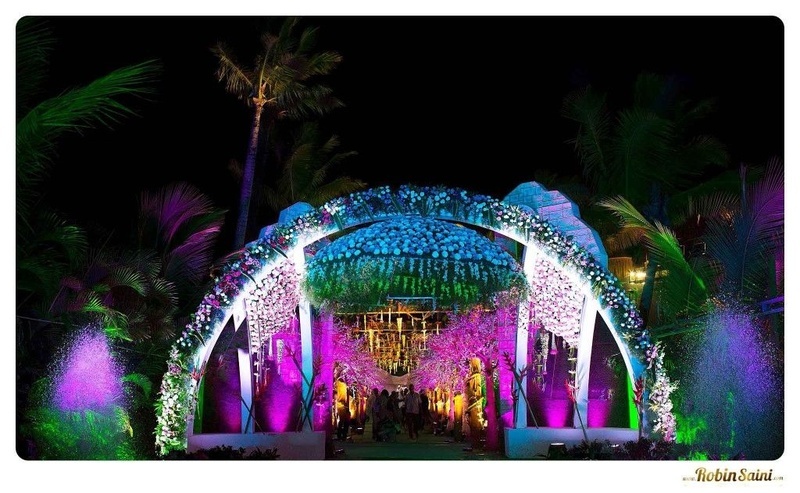 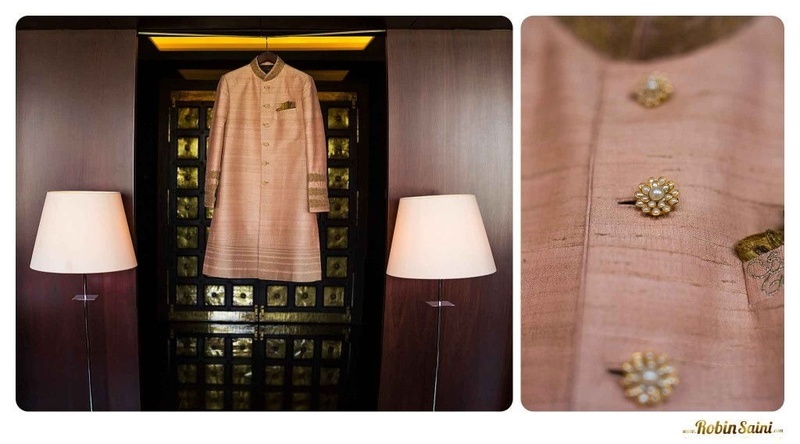 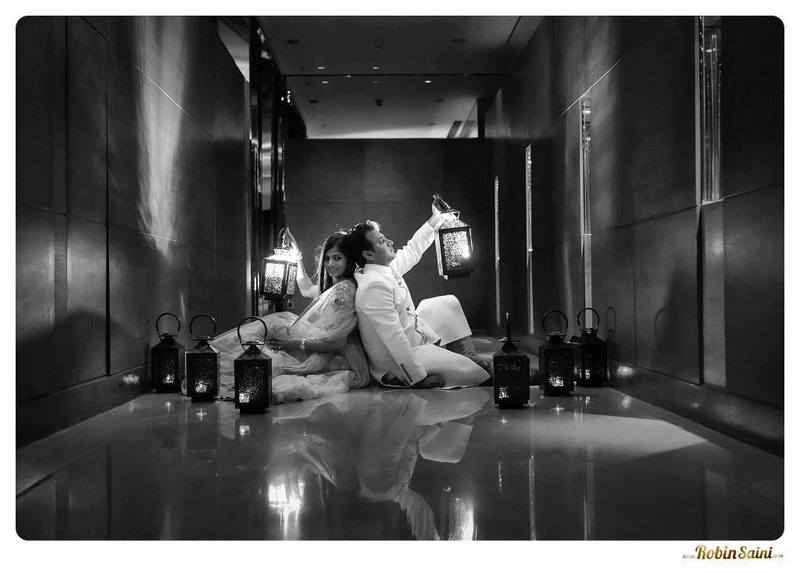 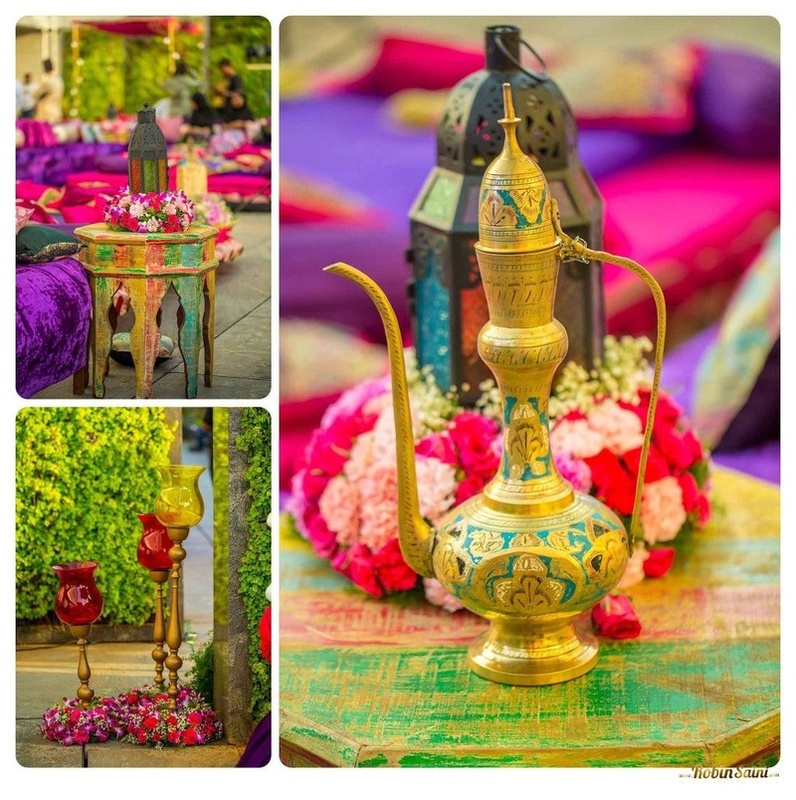 Right from the ‘Arabian Nights’ themed sangeet, up until the opulent wedding reception. 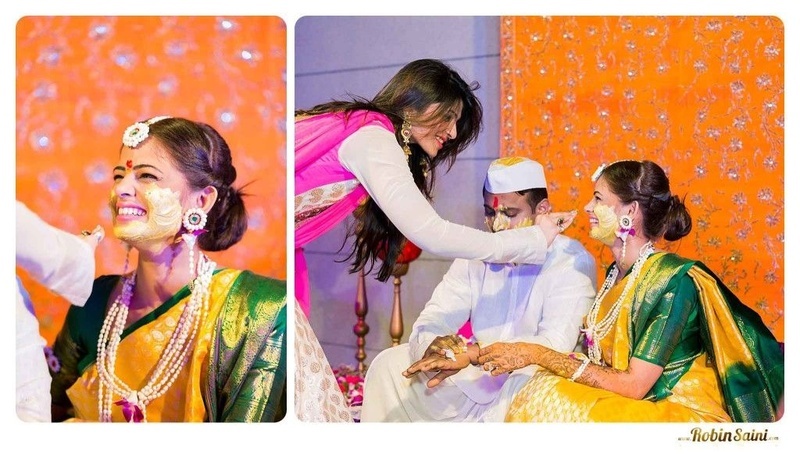 Celebrations kick started with the indoor Haldi Ceremony. 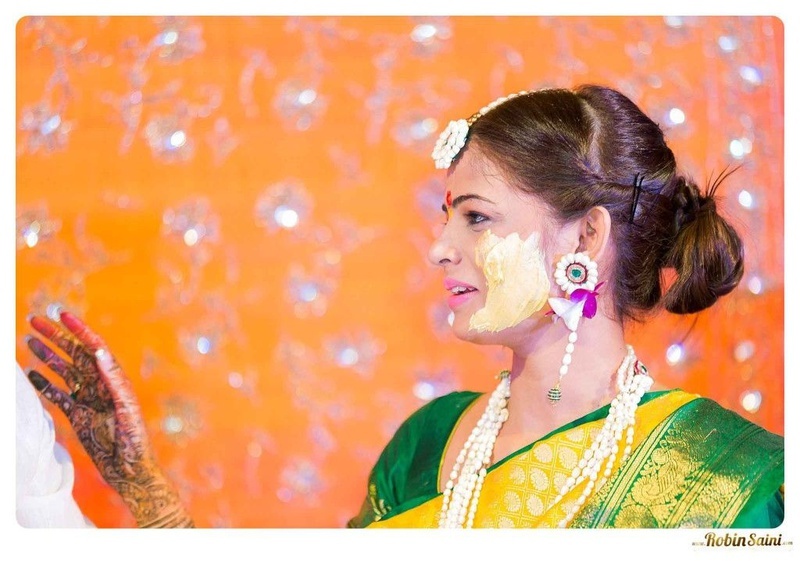 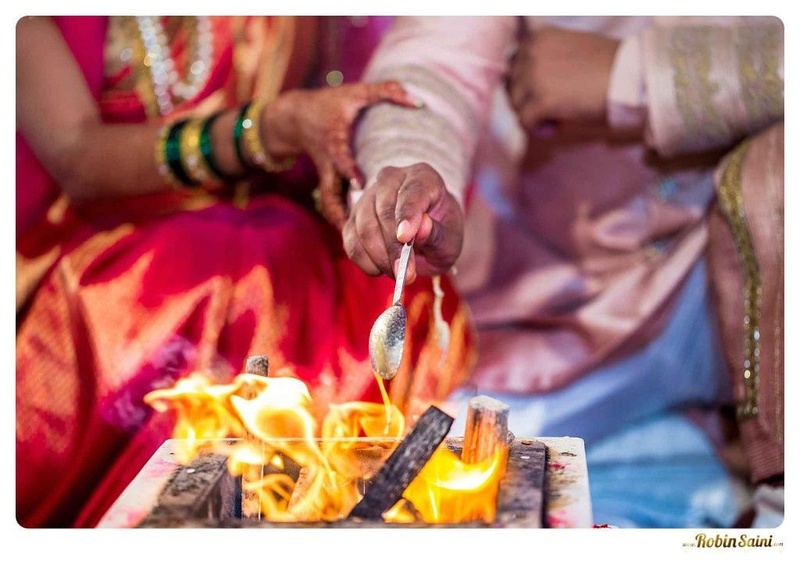 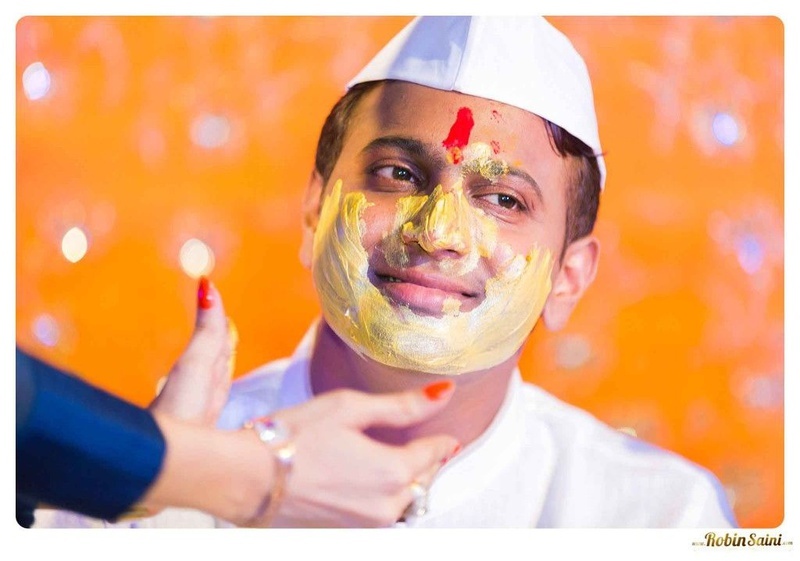 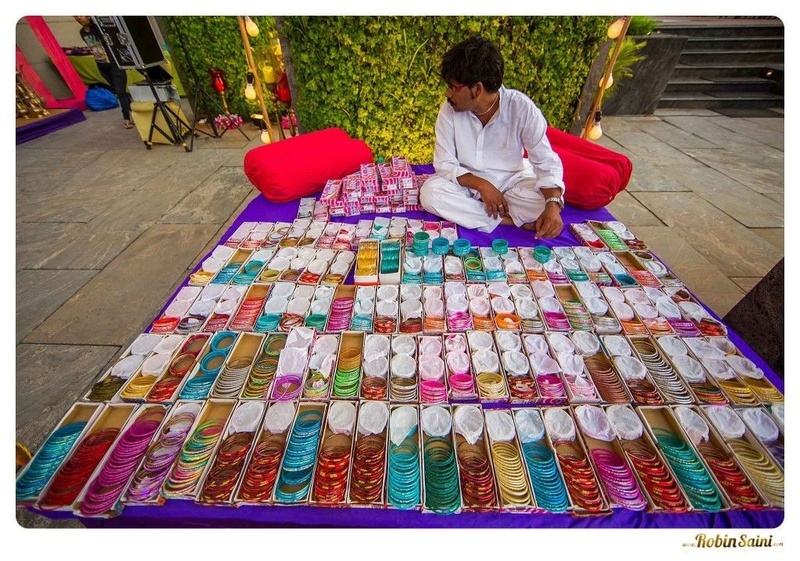 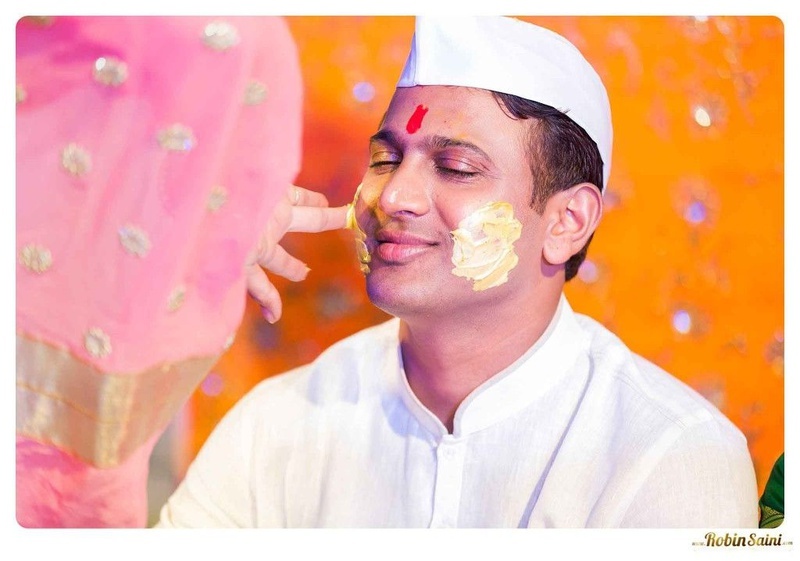 Bright colors used in the décor and outfits made this Haldi ceremony pop! 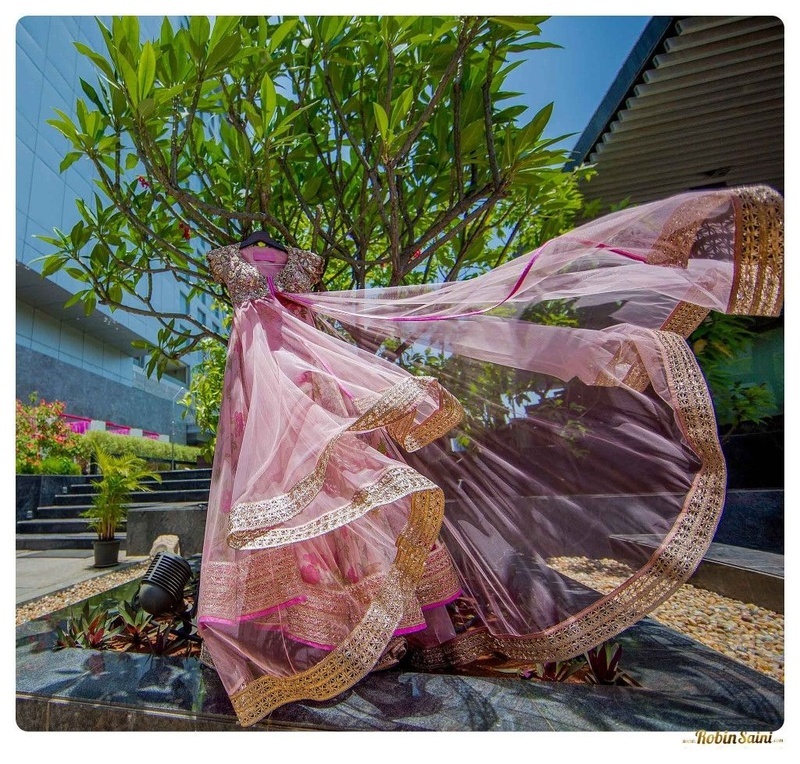 Rajshri’s Gaurang Shah silk saree was a brilliant detour from the usual cotton suits and lehenga’s that we’ve seen. 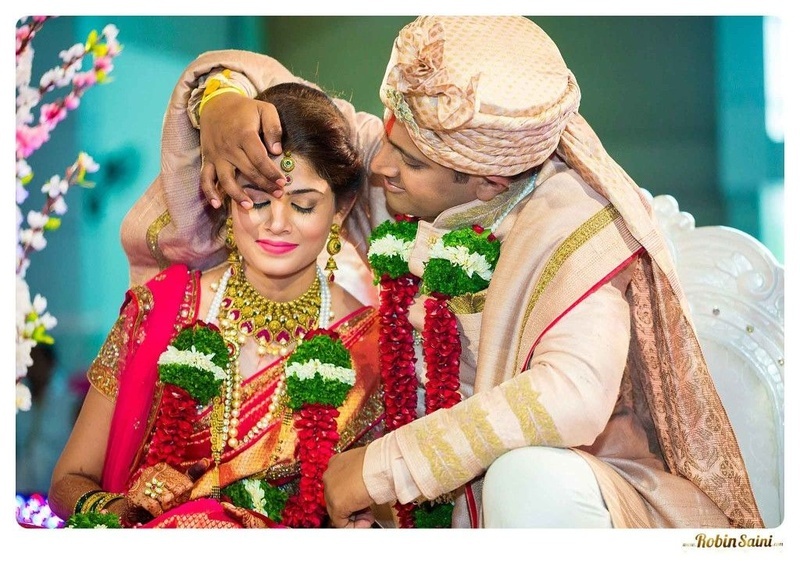 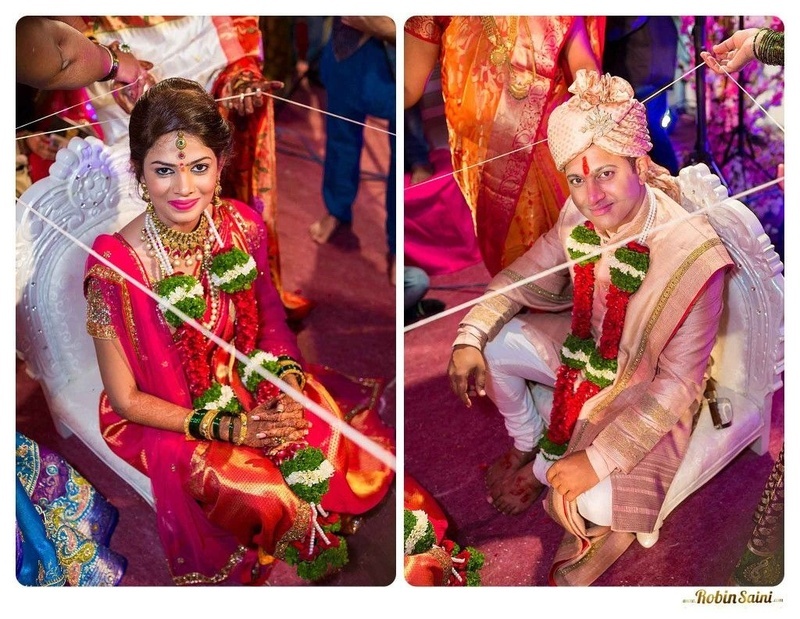 Her floral jewellery made with Jasmine buds and Orchids gave her entire ensemble a fresh edge. 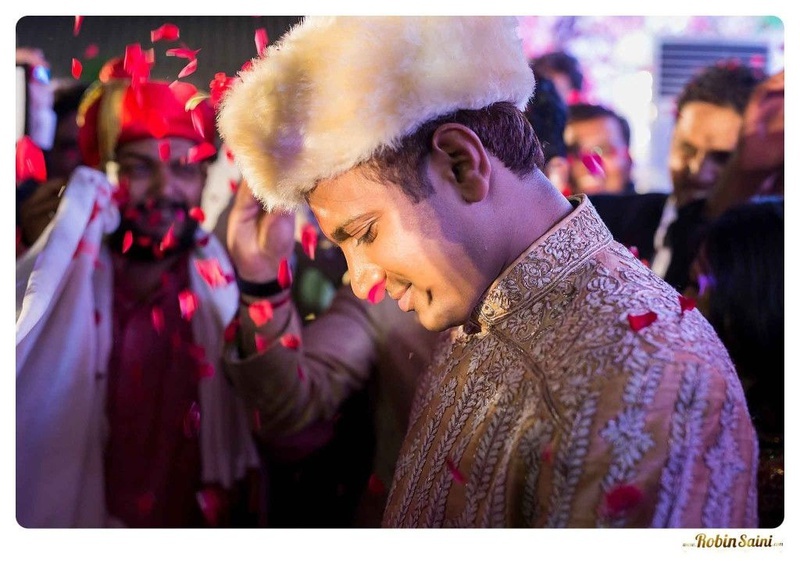 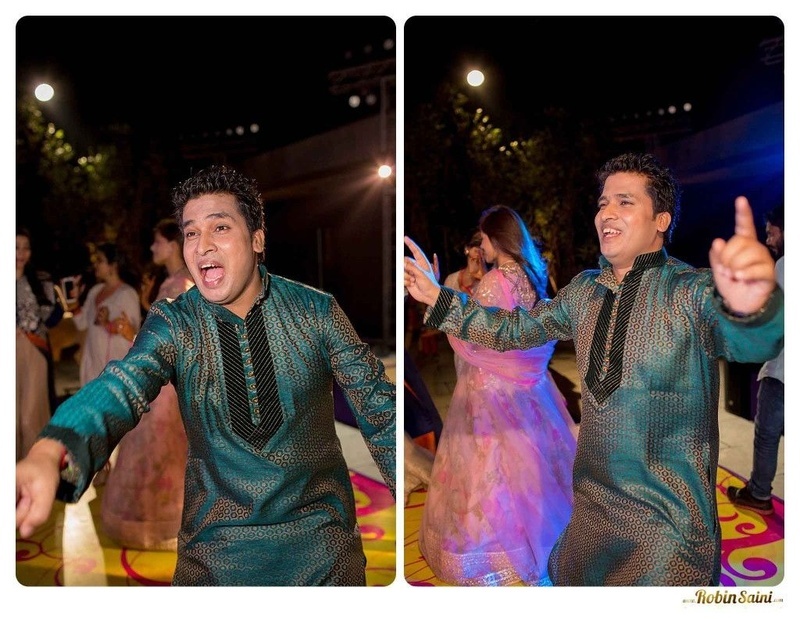 The ‘Arabian Nights’ themed Sangeet ceremony followed. 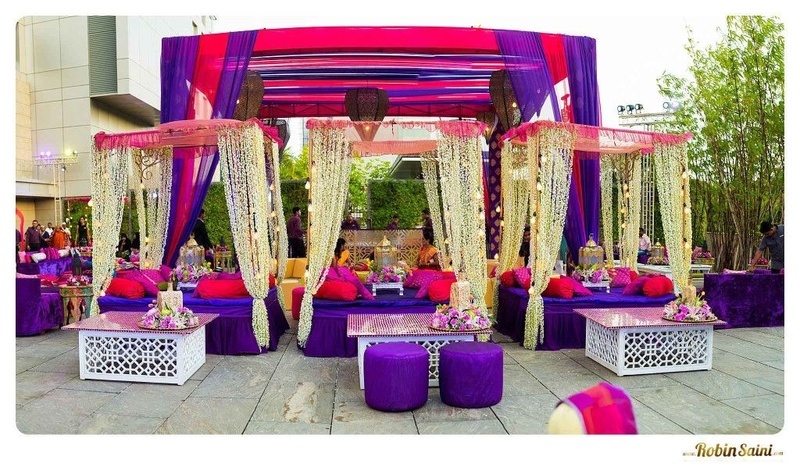 Fuschia and purple hued cabanas were set up with gorgeous vintage lamps, giving us aaaaall the Aladdin feels. 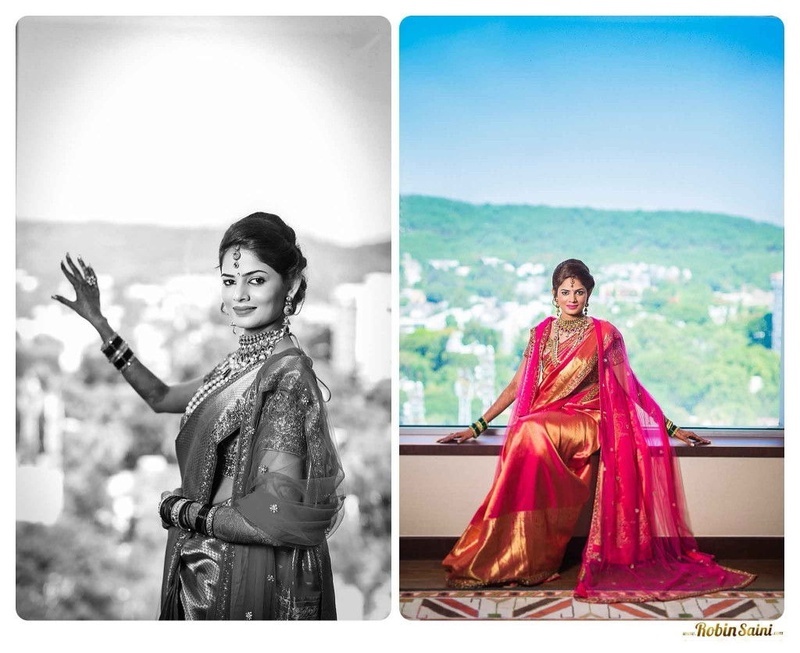 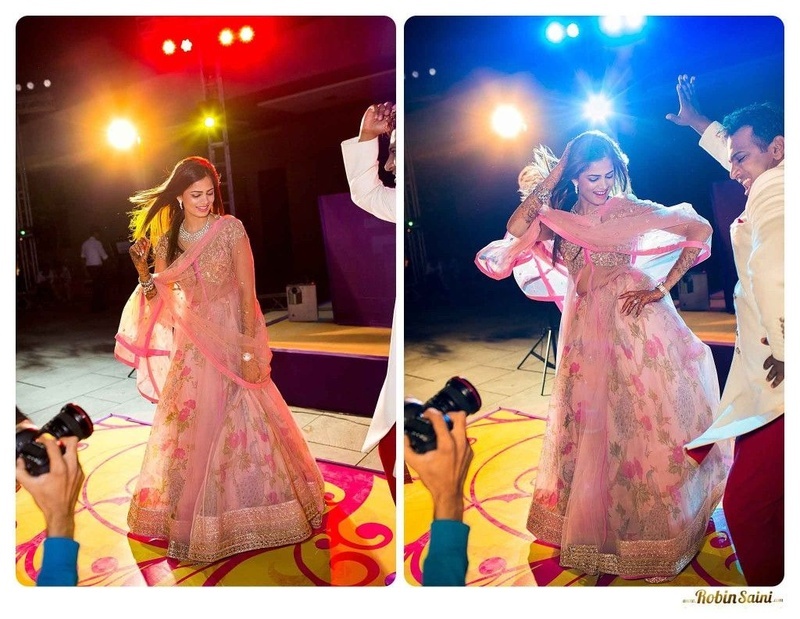 The gorgeous drapes and her own personal Chudiwala added the right touch of desi to this fun-filled Sangeet ceremony. 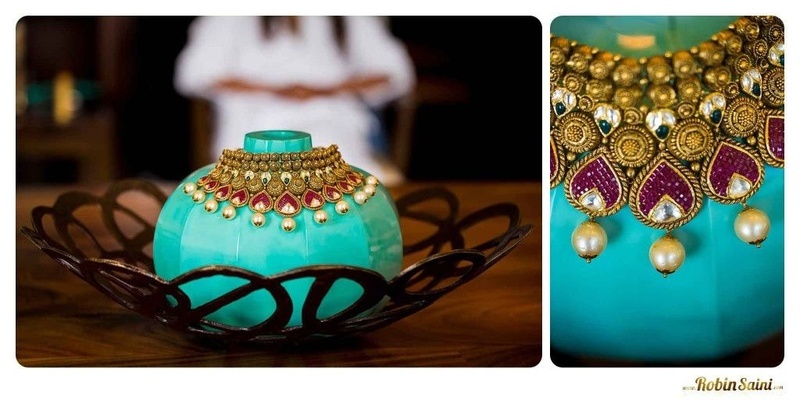 The colorful bangles set out, double up as décor and serve as a brilliant way to engage your guests. 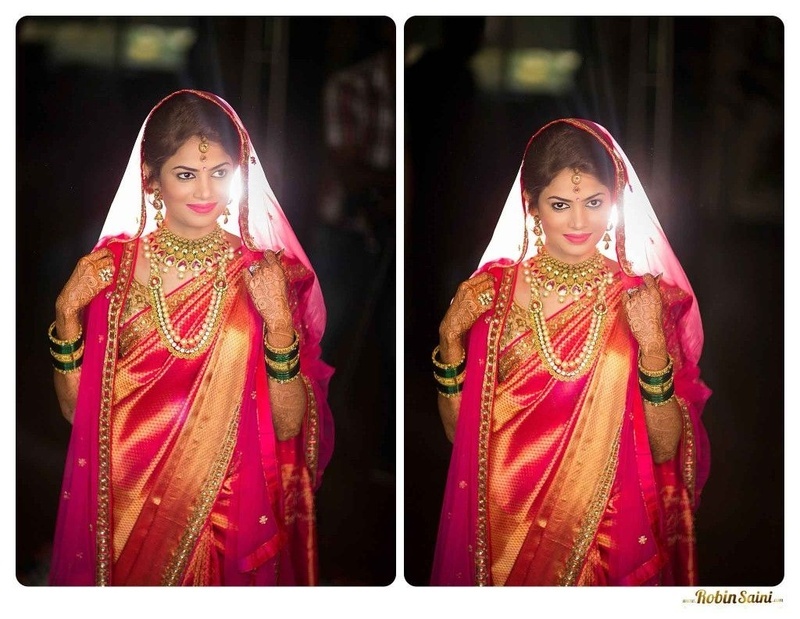 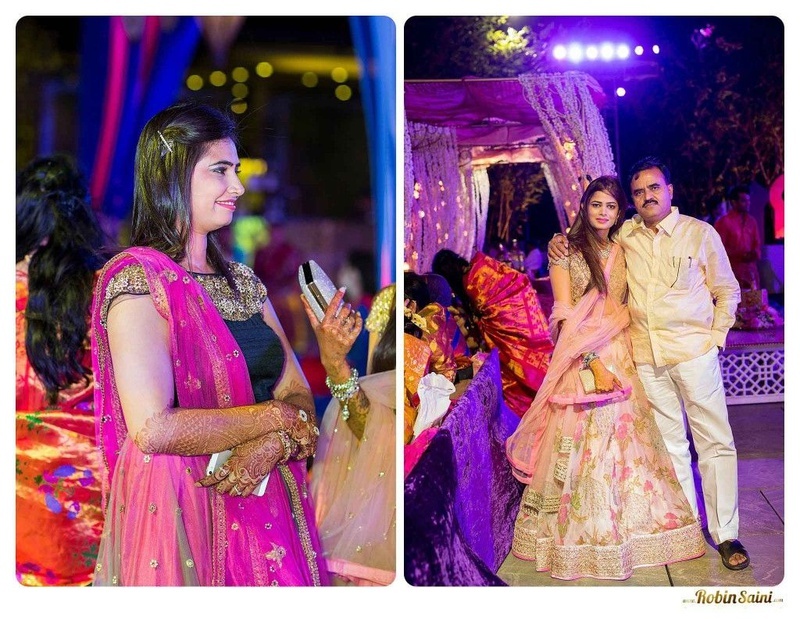 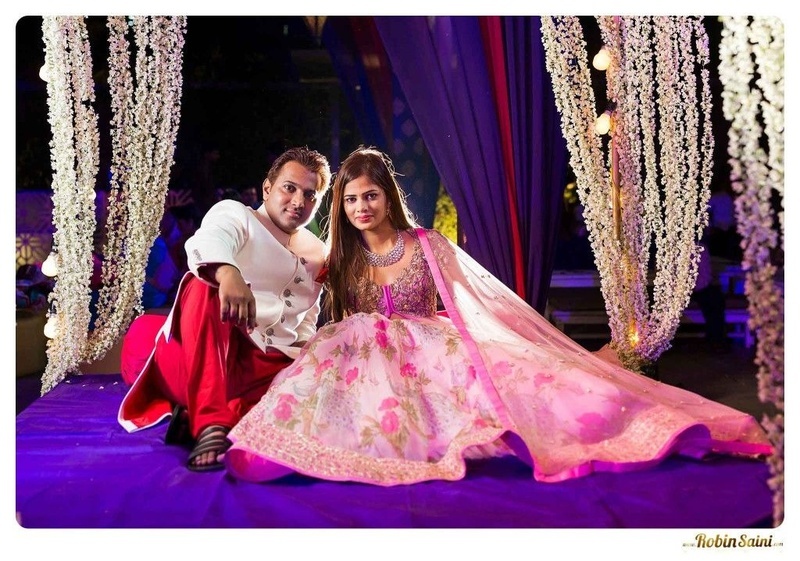 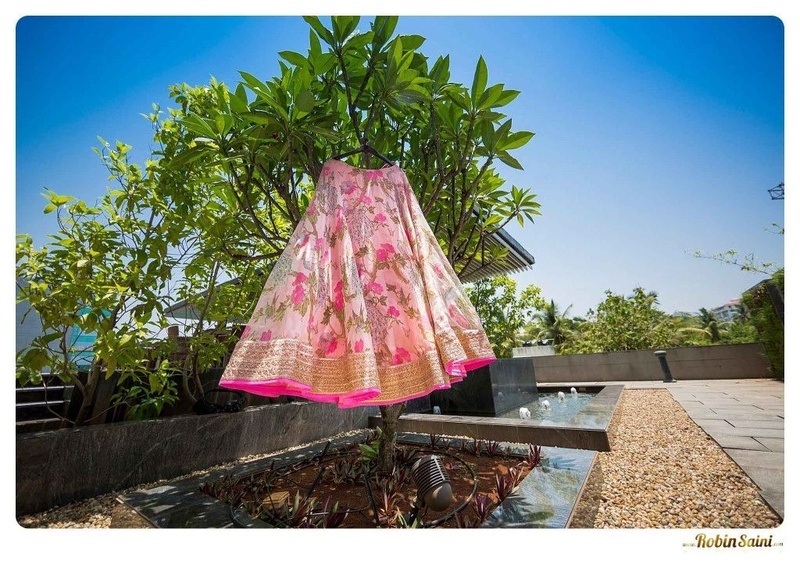 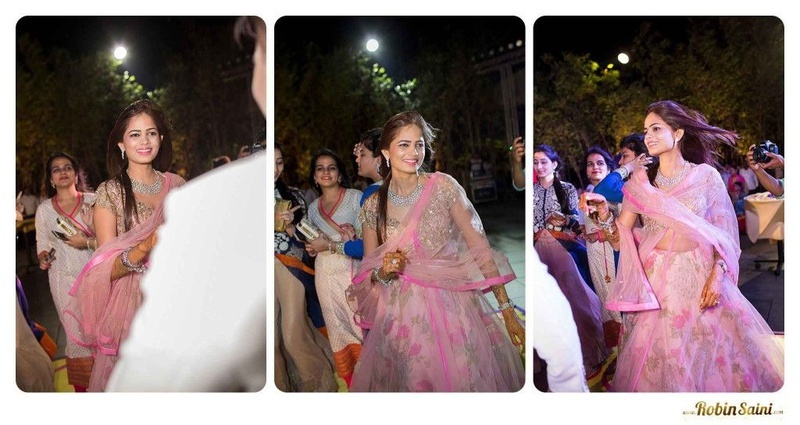 The stunning bride donned a blush pink floral lehenga by Anushree Reddy and looked absolutely ravishing. 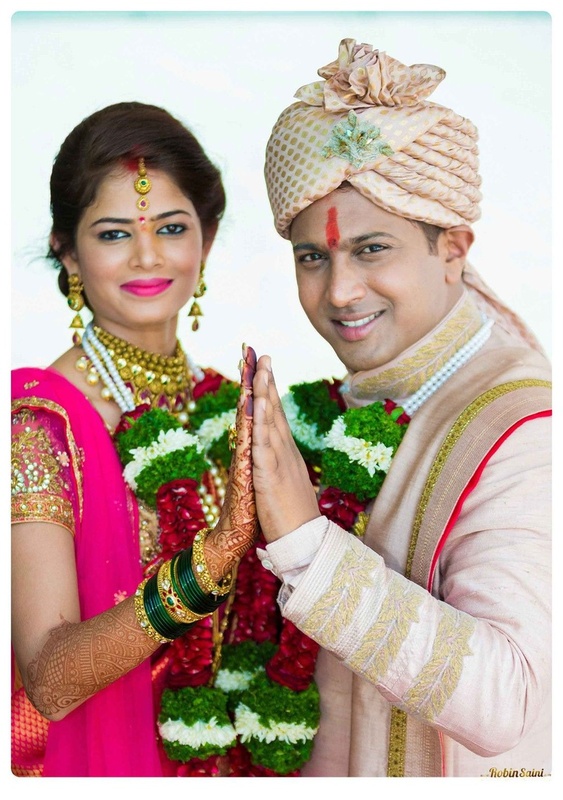 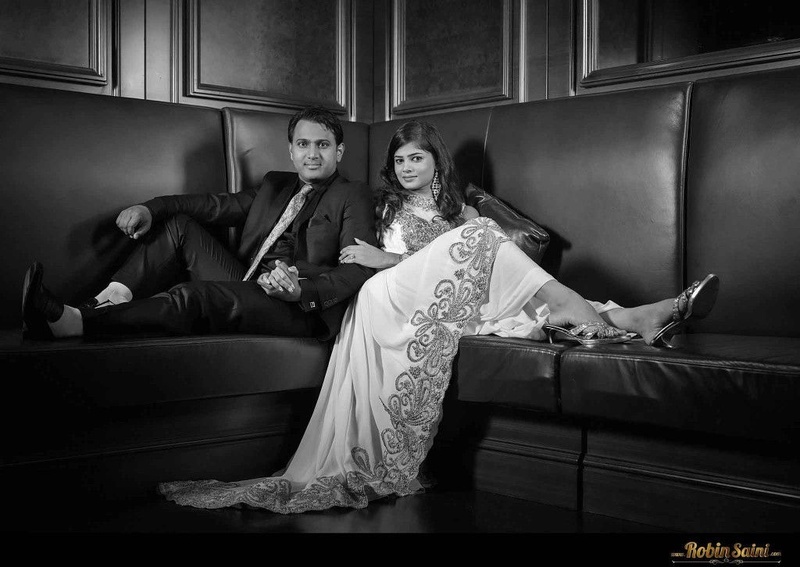 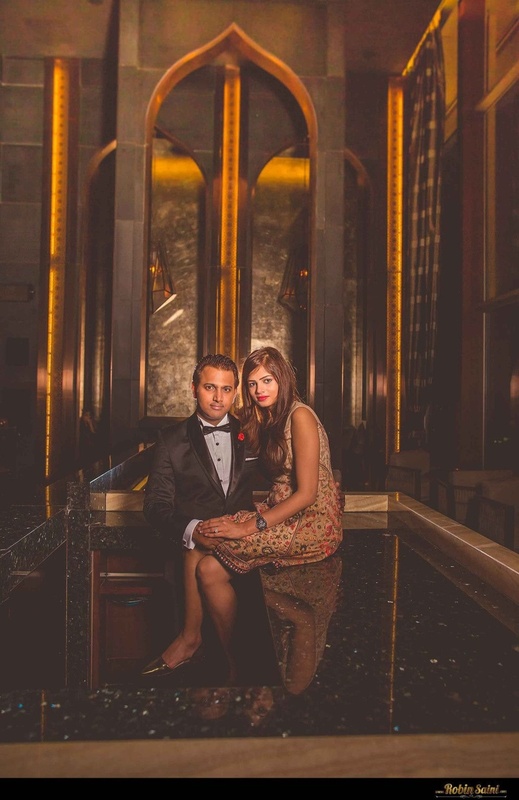 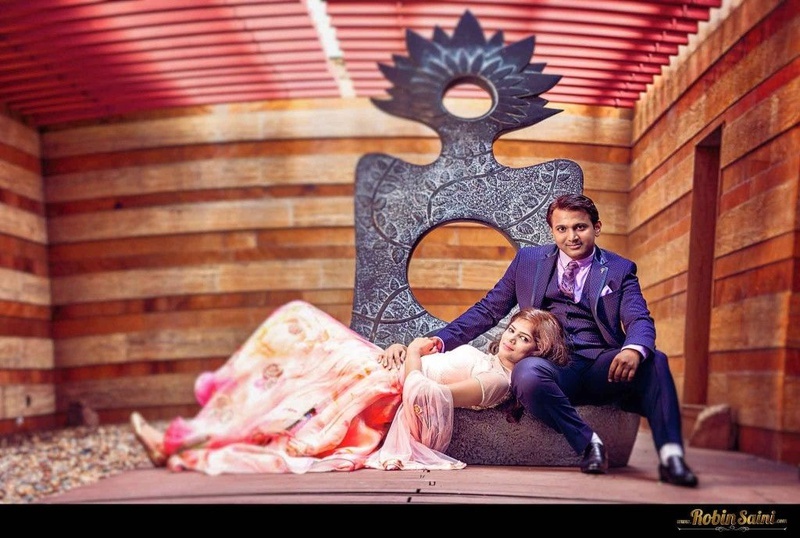 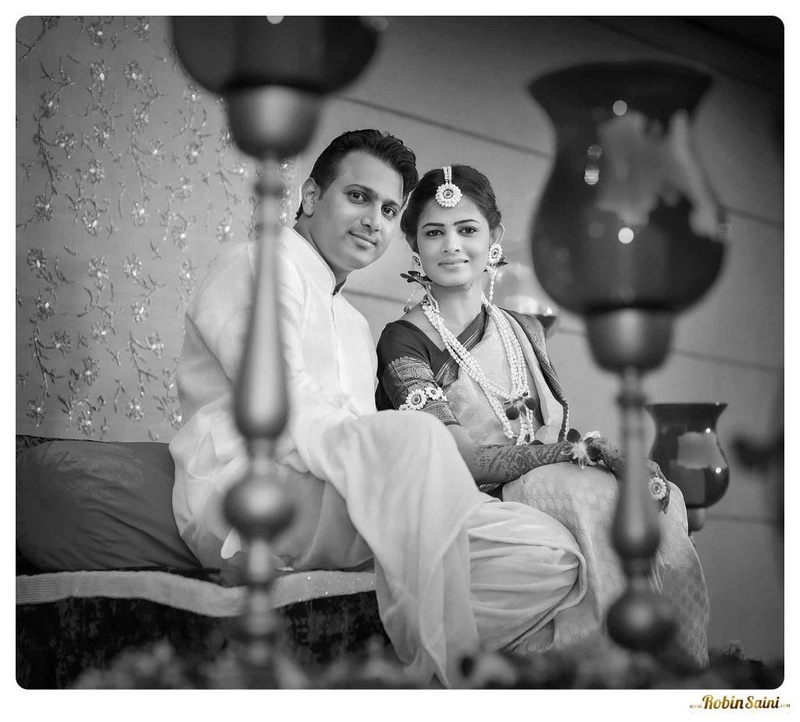 Summit’s white achkan and red dhoti blended perfectly with his beautiful bride’s outfit and the entire set up. 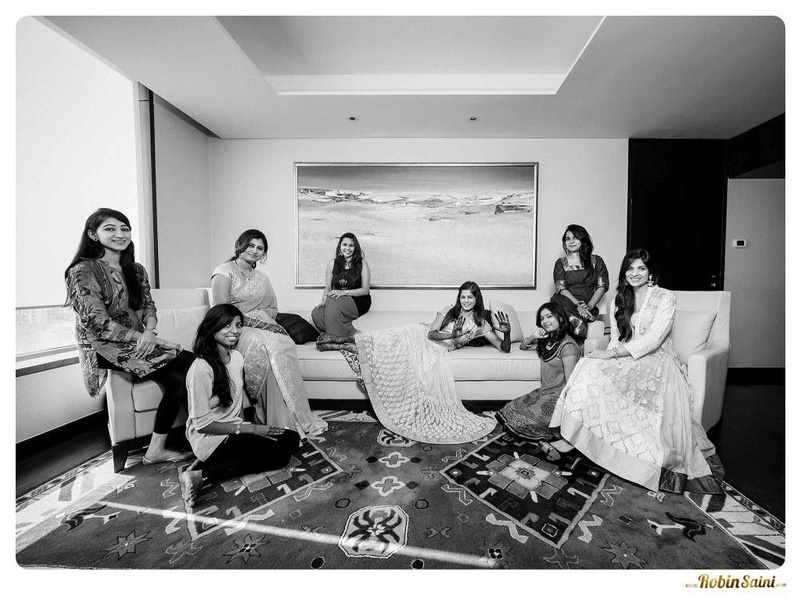 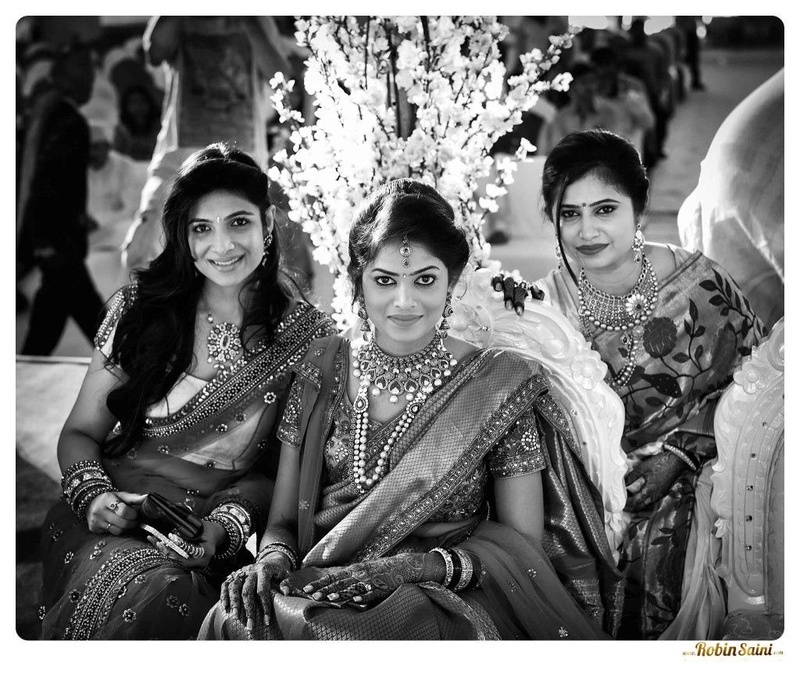 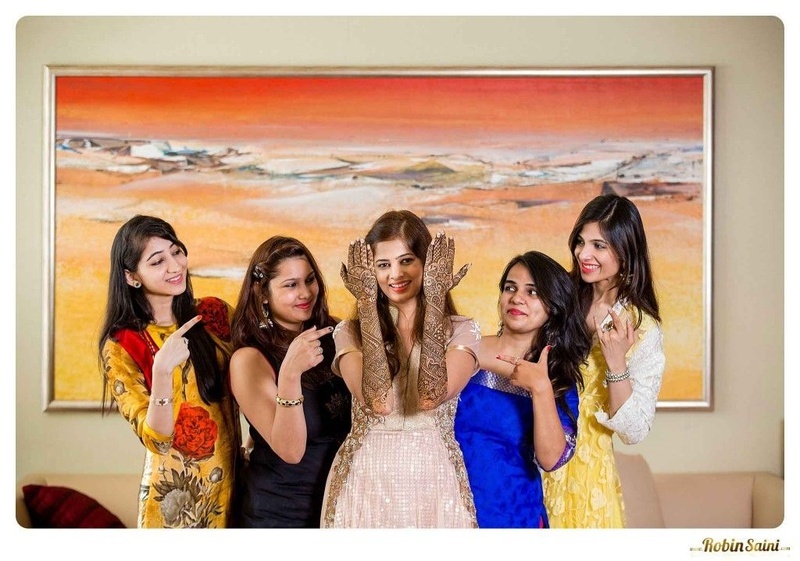 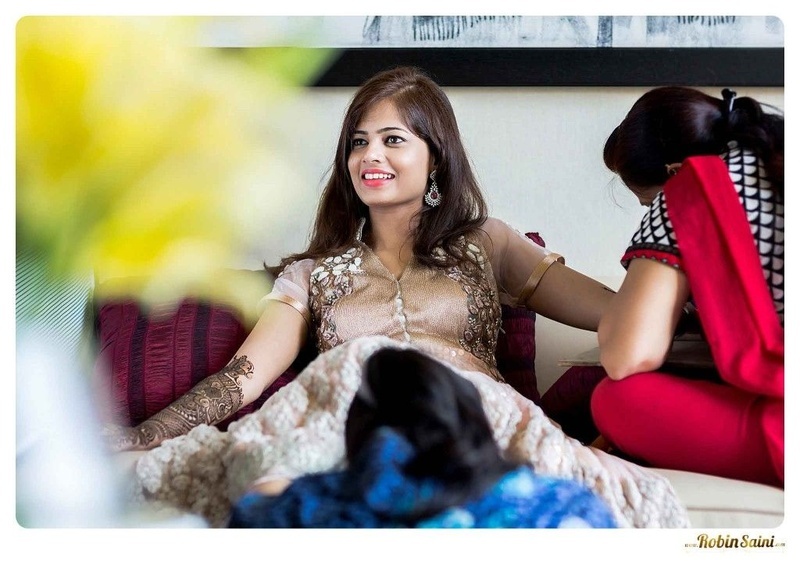 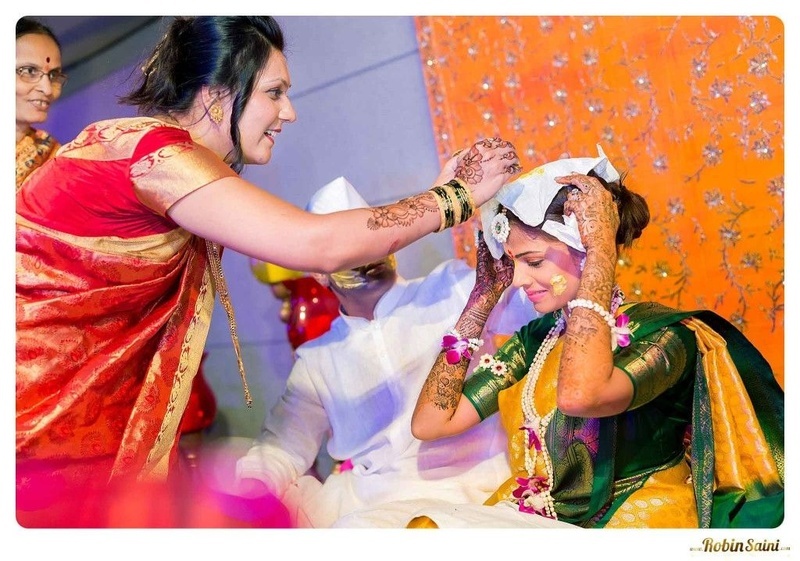 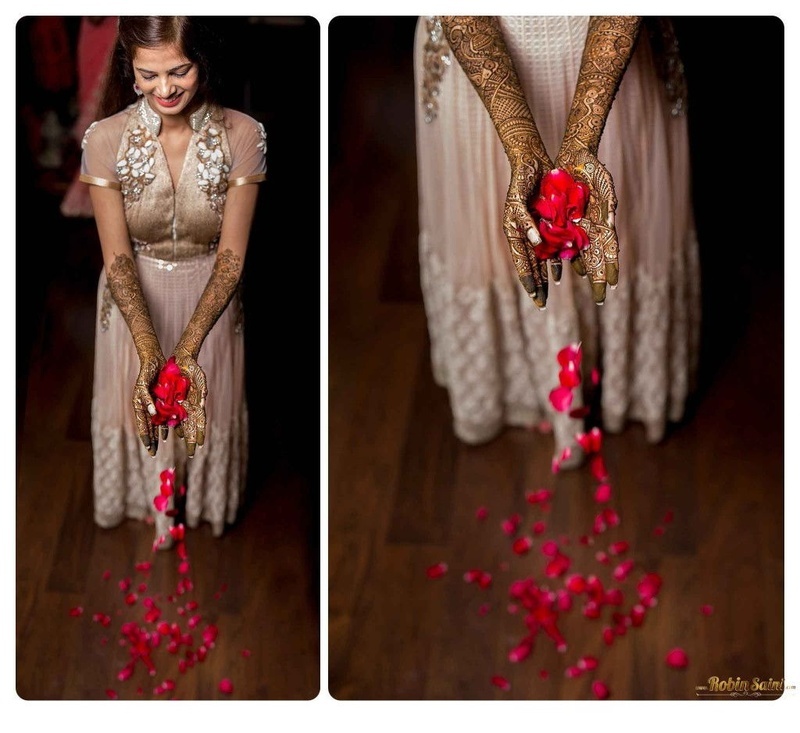 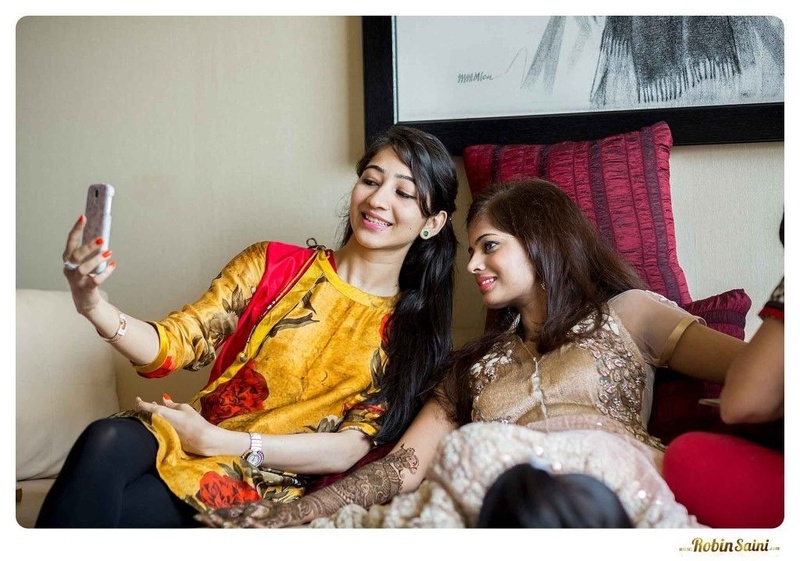 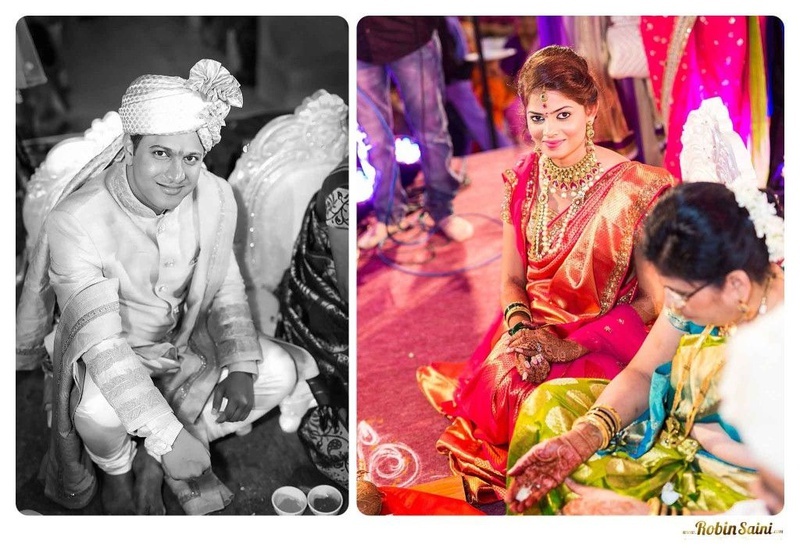 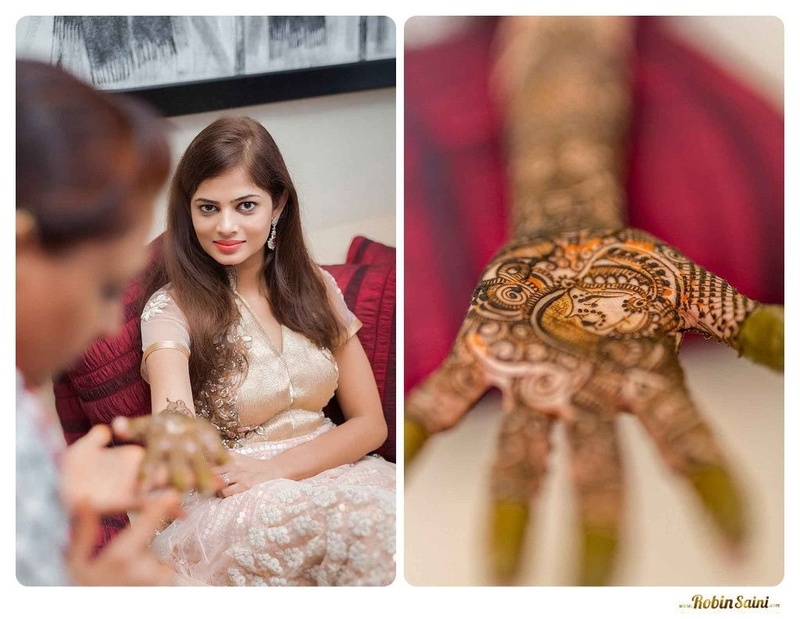 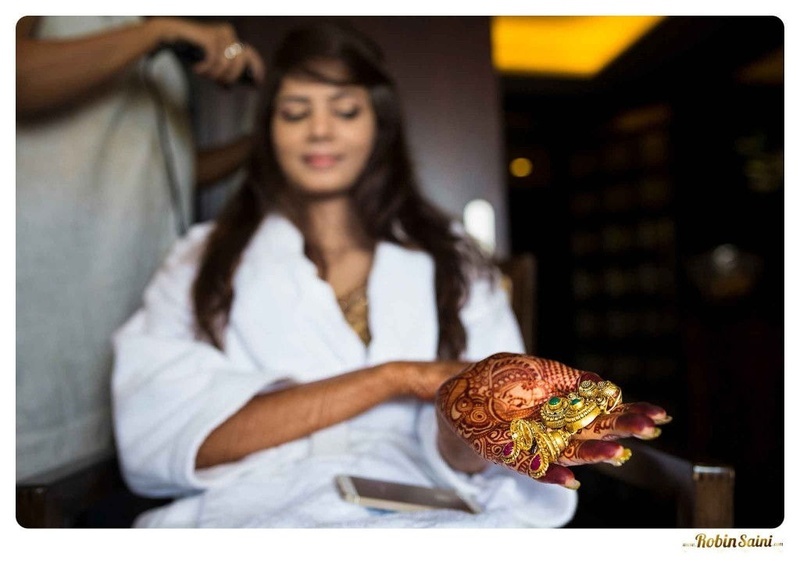 Rajshri opted to have a small and intimate mehendi ceremony with only close family and friends. 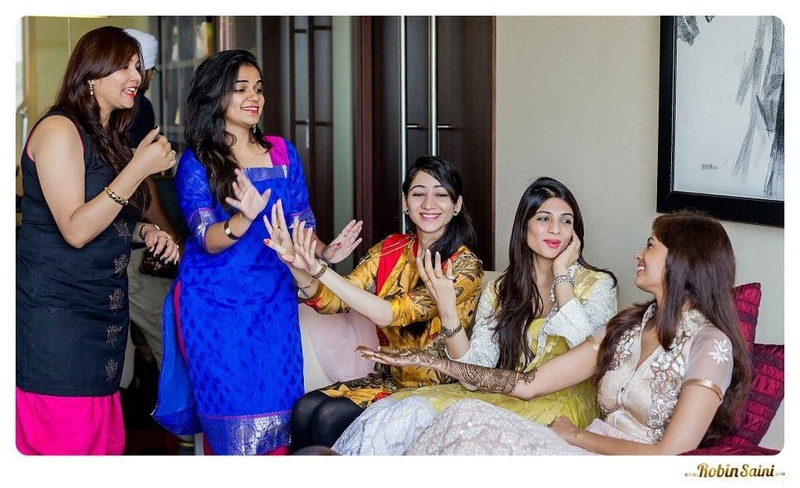 Sometimes it’s good to get away from the loud band-baja (cause there’s gonna be a LOT of that later) and spend the last few days of your spinsterhood with your closest sisters. 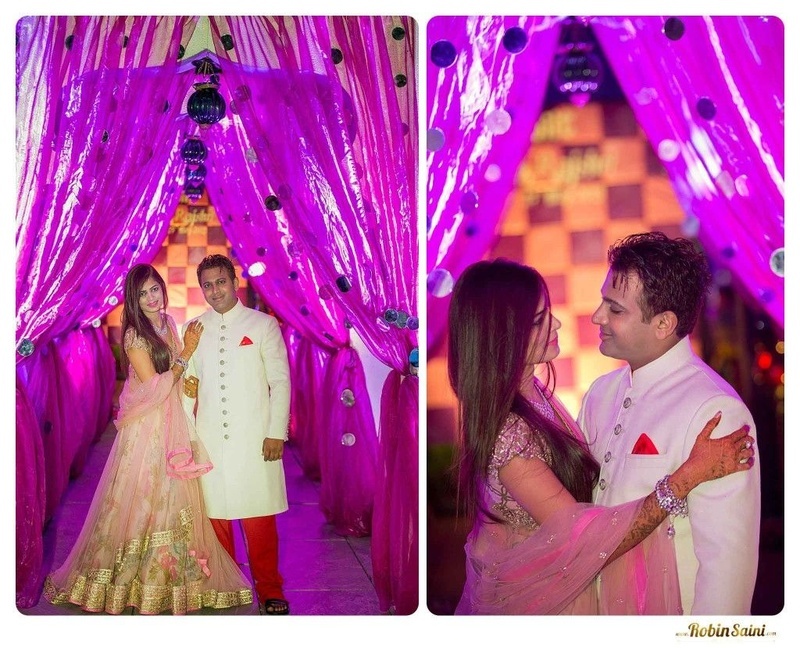 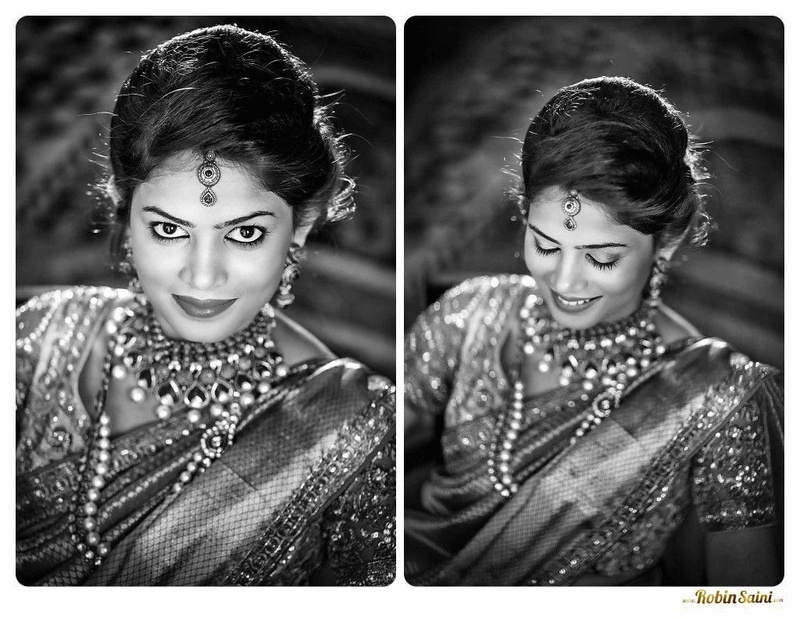 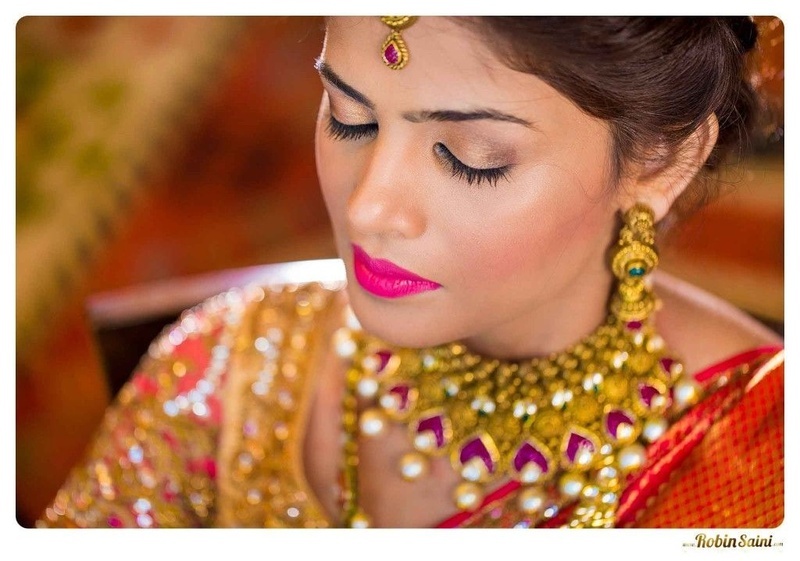 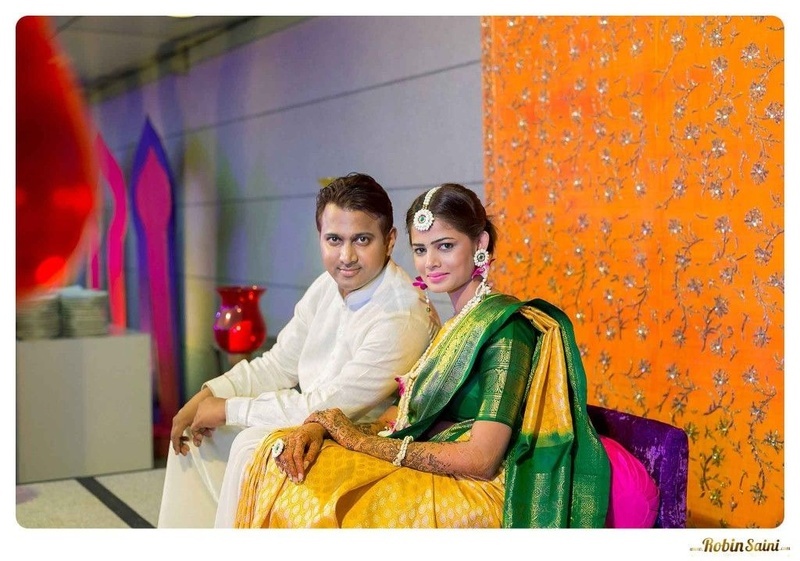 Her minimal make up and stunning Anushree Reddy anarkali was a perfect pick for this intimate indoor affair. 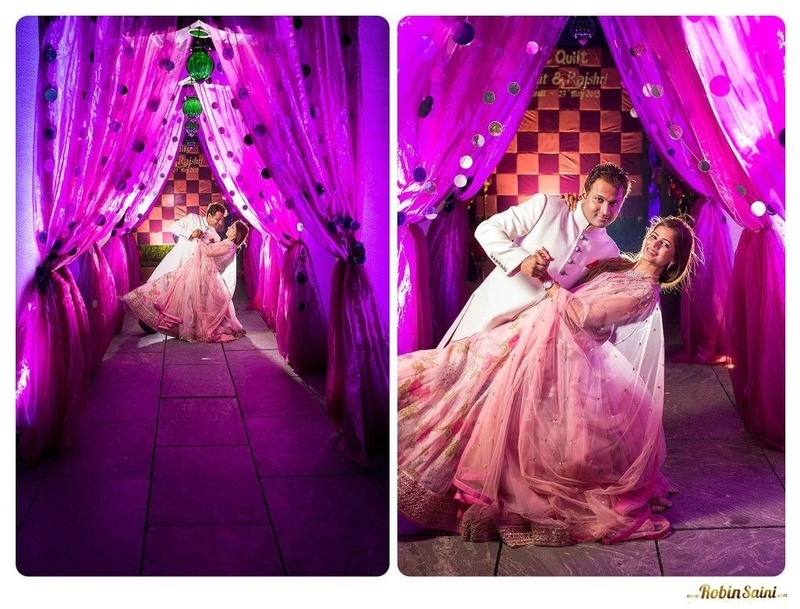 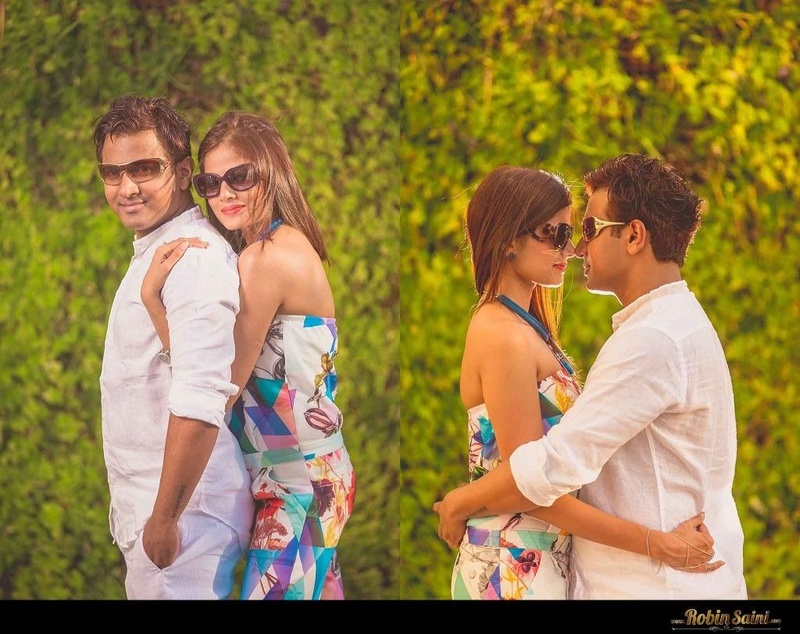 This couple went all out being brand-crazy! 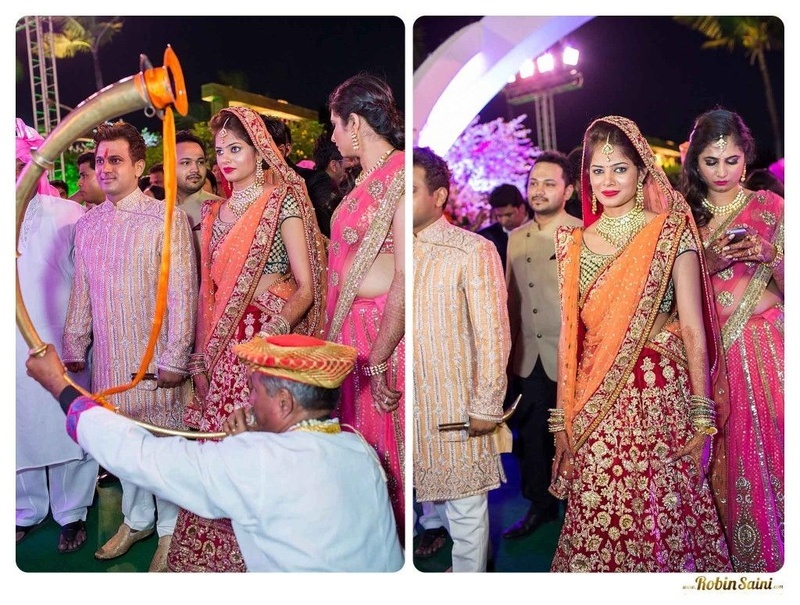 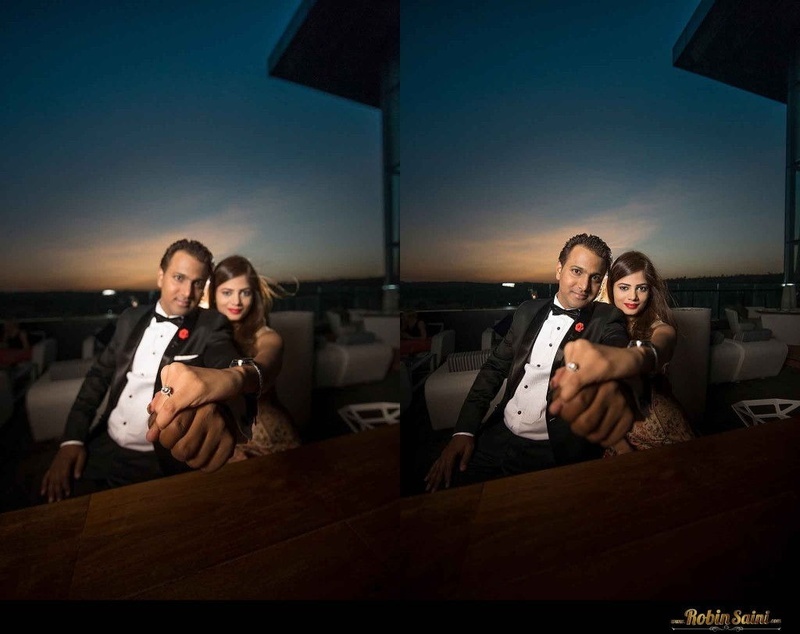 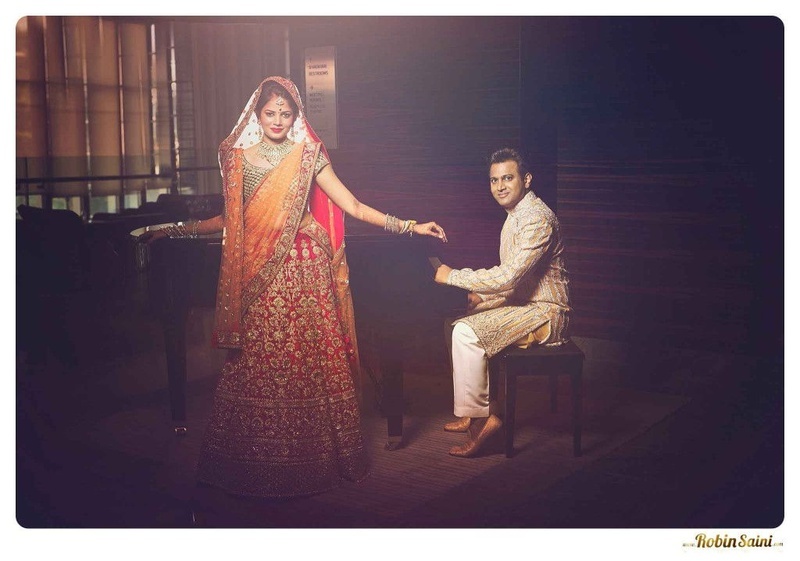 Summit’s Shantanu and Nikhil sherwani and Rajshri’s pink and orange dhoop-chhaon saree from Neeta Lulla had them looking like something out of a Karan Johar romantic film! 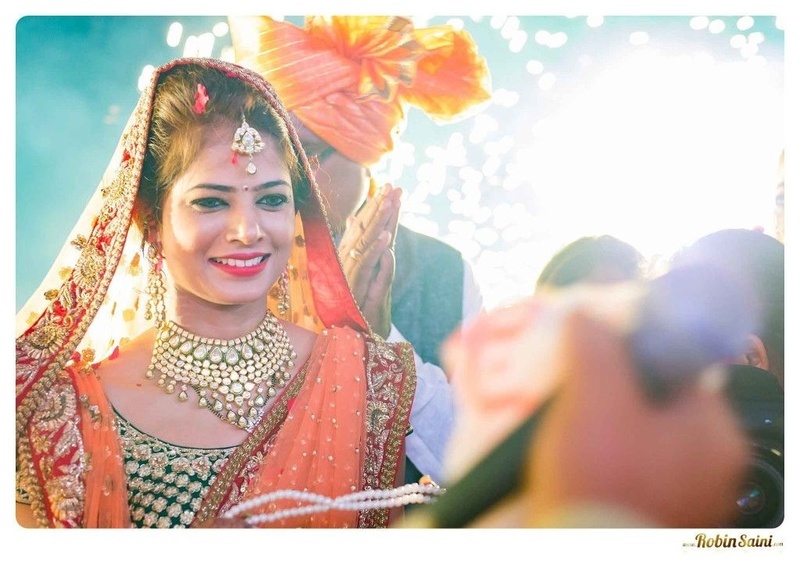 Her bold multistrand antique gold necklace from Tribovandas Bhimji Zaveri added the right amount of royalty to her entire ensemble. 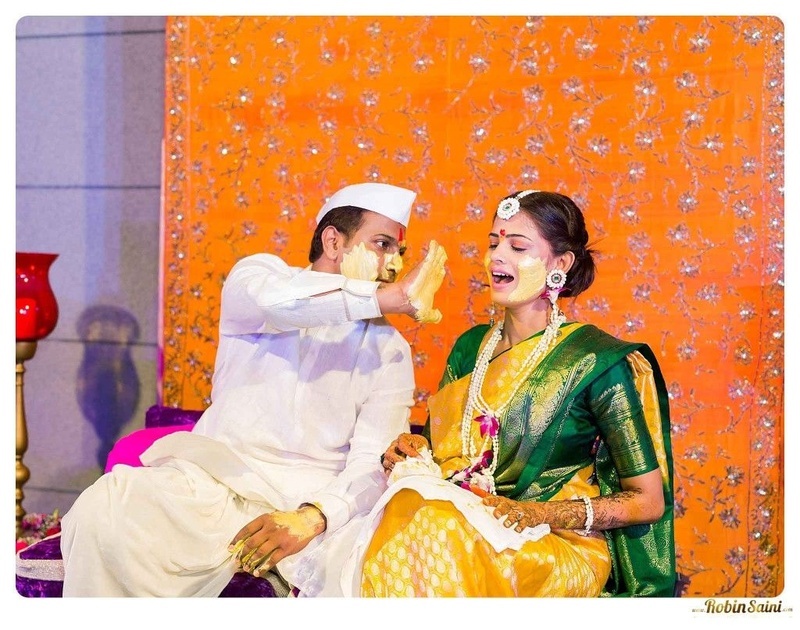 The couple went from strength to strength with each passing ceremony. 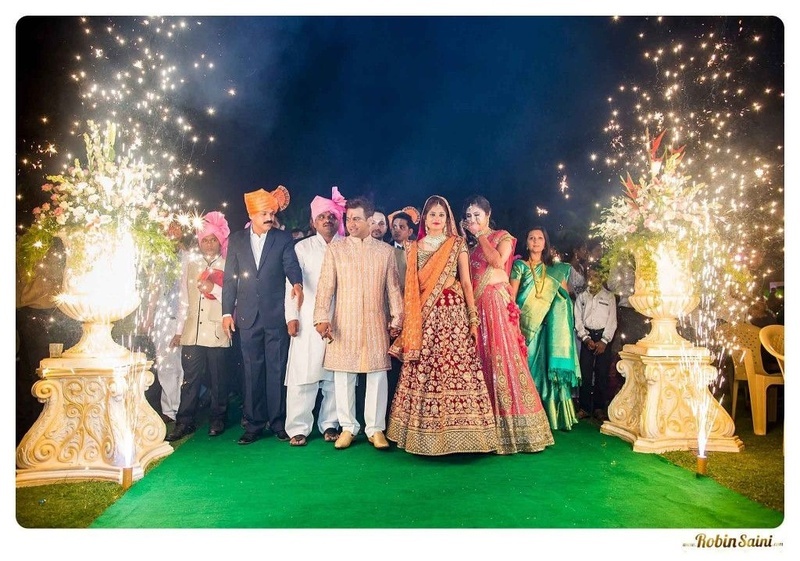 The gorgeous bride donned a gold embroidered two-toned Sabyasachi lehenga with ethnic polki jewellery while Summit pulled off a champagne sherwani by Manish Malhotra better than most Bollywood actors nowadays. 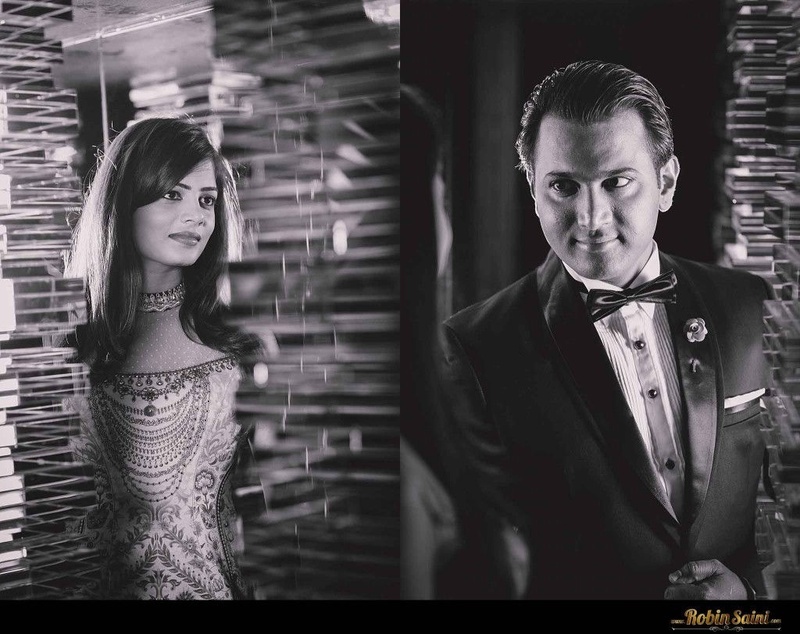 In conclusion, this stunningly captured wedding celebration was everything dreams are made of! 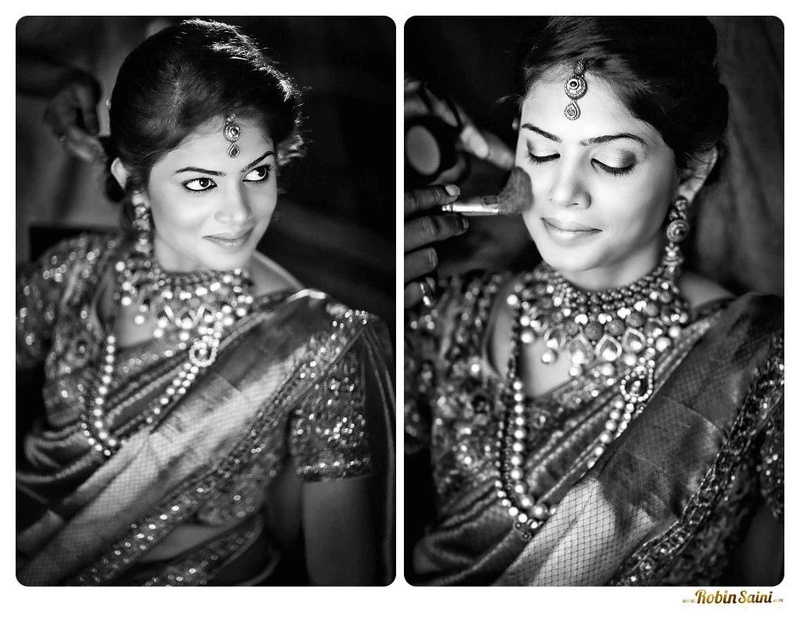 The clothes, the jewellery, the décor! 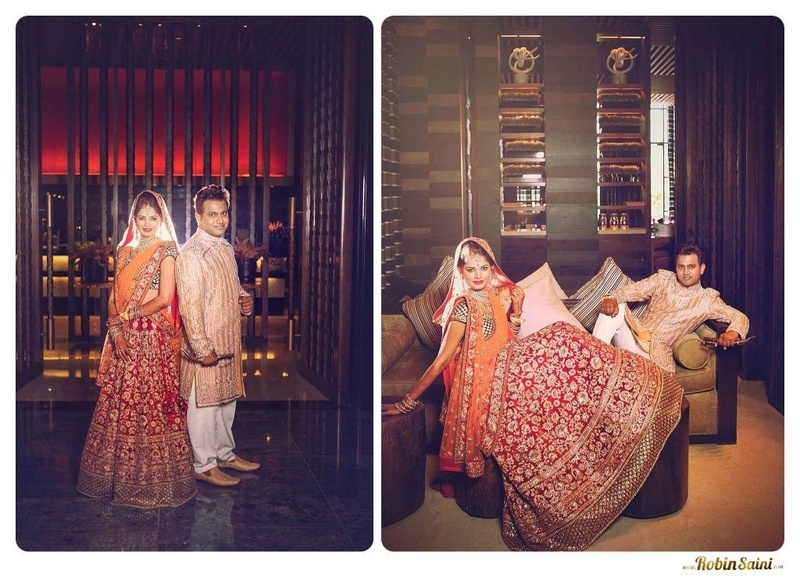 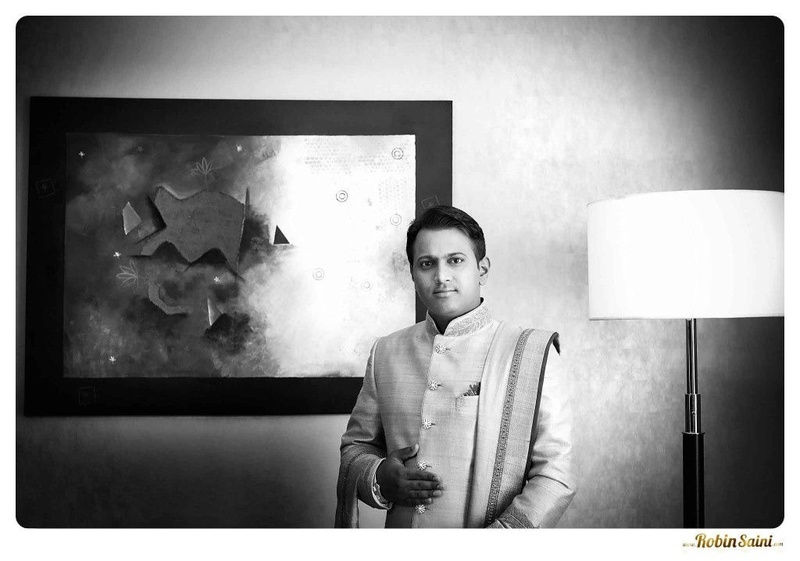 Every element of this marriage was done with true style and class, still not leaving behind the traditional touch. 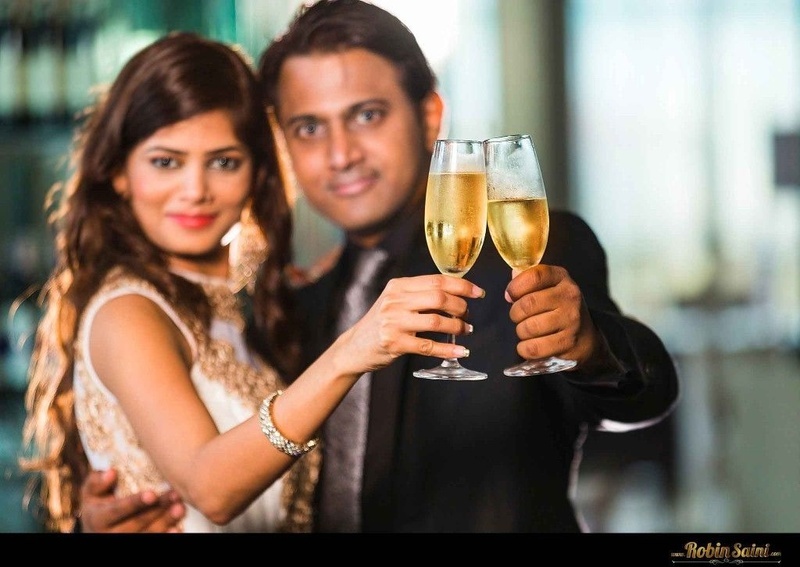 Raising a toast to new beginnings! 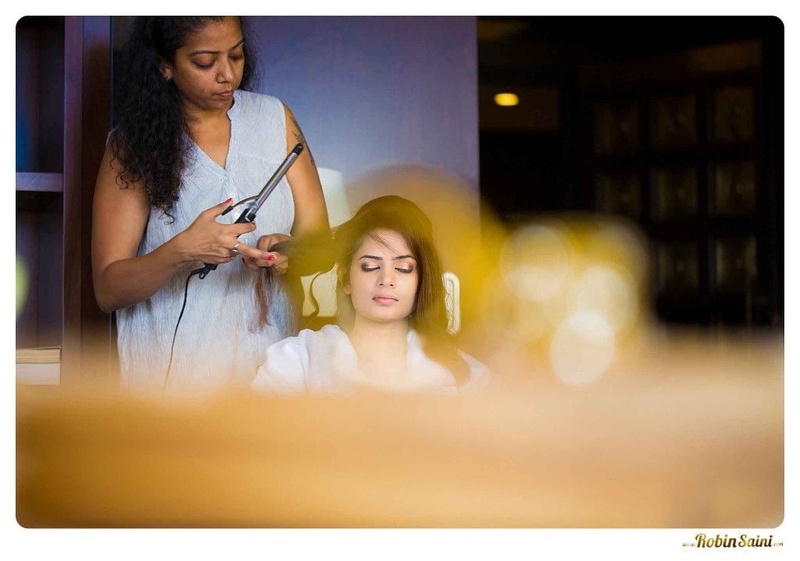 Bride-to-be getting ready for her big day!